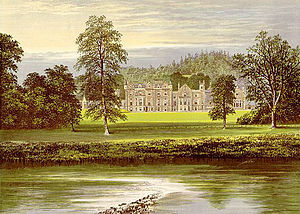 Abbotsford is a historic country house in the Scottish Borders, near Melrose, on the south bank of the River Tweed. It was formerly the residence of historical novelist and poet, Sir Walter Scott. It is a Category A Listed Building and the estate is listed in the Inventory of Gardens and Designed Landscapes in Scotland. The nucleus of the estate was a small farm of 100 acres (0.40 km2), called Cartleyhole, nicknamed Clarty (i.e., muddy) Hole, and was bought by Scott on the lapse of his lease (1811) of the neighbouring house of Ashestiel. He first built a small villa and named it Abbotsford, creating the name from a ford nearby where previously abbots of Melrose Abbey used to cross the river. Scott then built additions to the house and made it into a mansion, building into the walls many sculptured stones from ruined castles and abbeys of Scotland. In it he gathered a large library, a collection of ancient furniture, arms and armour, and other relics and curiosities, especially connected with Scottish history, notably the Celtic Torrs Pony-cap and Horns and the Woodwrae Stone, all now in the Museum of Scotland. The general ground-plan is a parallelogram, with irregular outlines, one side overlooking the Tweed; and the style is mainly the Scottish Baronial. The estate is recognized as a highly influential creation for the Scottish Baronial style with themes from Abbotsford being reflected across many buildings in the Scottish Borders. The manor as a whole appears as a "castle-in-miniature," with small towers and imitation battlements decorating the house and garden walls. Into various parts of the fabric were built relics and curiosities from historical structures, such as the doorway of the old Tolbooth in Edinburgh. Scott collected many of these curiosities to be built into the walls of the South Garden, which previously hosted a colonnade of gothic arches along the garden walls. Along the path of the former colonnade sits the remains of Edinburgh's 15th century Mercat Cross and several examples of classical sculpture. The estate and its neo-Medieval features nod towards Scott's desire for a historical feel, but the writer ensured that the house would provide all the comforts of modern living. As a result, Scott used the space as a proving-ground for new technologies. The house was outfitted with early gas lighting and pneumatic bells connecting residents with servants elsewhere in the house. Scott's only son Walter did not live to enjoy the property, having died on his way from India in 1847. Among subsequent possessors were Scott's son-in-law, John Gibson Lockhart, J. R. Hope Scott, QC, and his daughter (Scott's great-granddaughter), the Hon. Mrs Maxwell Scott. Abbotsford House as seen from the gardens. The house was opened to the public in 1833, but continued to be occupied by Scott's descendants until 2004. The last of his direct descendants to hold the Lairdship of Abbotsford was his great-great-great-granddaughter Dame Jean Maxwell-Scott (8 June 1923 – 5 May 2004). She inherited it from her elder sister Patricia Maxwell-Scott in 1998. The sisters turned the house into one of Scotland's premier tourist attractions, after they had to rely on paying visitors to afford the upkeep of the house. It had electricity installed only in 1962. Dame Jean was at one time a lady-in-waiting to Princess Alice, Duchess of Gloucester, patron of the Dandie Dinmont Club, a breed of dog named after one of Sir Walter Scott's characters; and a horse trainer, one of whose horses, Sir Wattie, ridden by Ian Stark, won two silver medals at the 1988 Summer Olympics. Sir Walter Scott rescued the "jougs" from Threave Castle in Dumfries and Galloway and attached them to the castellated gateway he built at Abbotsford. Tweedbank railway station is located near to Abbotsford House. In 2012, a new Visitor Centre opened at Abbotsford which houses a small exhibition, gift shop and Ochiltree's Dining, a café/restaurant with views over the house and grounds. In 2014 it won the European Union Prize for Cultural Heritage / Europa Nostra Award for its recent conservation project. ^ "Torrs pony cap". Museum of Scotland. Retrieved 25 July 2018. ^ "Woodrae Castle: Cross Slab(S) (Pictish), Pictish Symbol Stone(S) (Pictish)". Canmore. Retrieved 25 July 2018. ^ Buck, Michael (1 November 2013). "Early Planning at Abbotsford, 1811–12: Walter Scott, William Stark and the Cottage that Never Was". Architectural heritage : the journal of the Architectural Heritage Society of Scotland. 24: 41–65. ^ Irving, Gordon (July 1971). "Sir Walter Scott's Abbotsford House". The Christian Science Monitor. (1908-Current File): 13 – via ProQuest. ^ Russell, Vivian (10 October 2003). 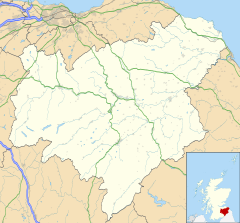 "'The ugliest place on Tweedside'". ISSN 0307-1235. Retrieved 20 November 2018. ^ Rigney, Ann (2007). "Abbotsford: Dislocation and Cultural Remembrance". Writers' Houses and the Making of Memory. 1: 76–77 – via ProQuest. ^ Sydney Morning Herald staff 2004, p. 32. ^ Napier 1897, p. 153. ^ "Europa Nostra". Europa Nostra. Retrieved 3 February 2016. ^ "European Commission – PRESS RELEASES – Press release – Winners of 2014 EU Prize for Cultural Heritage / Europa Nostra Awards announced". Europa (web portal). Retrieved 3 February 2016. Historic Environment Scotland. "ABBOTSFORD INCLUDING HOUSE, WALLED GARDENS AND COURTYARDS, CONSERVATORY, BOTHIES, GAME LARDER, ICE HOUSE, TERRACES, GATE LODGE, BOUNDARY WALLS, GARDENER'S COTTAGE, STABLE BLOCK, GARDEN STATUARY AND ALL OTHER ANCILLARY STRUCTURES (Category A) (LB15104)". Retrieved 26 February 2019. Historic Environment Scotland. "ABBOTSFORD (GDL00001)". Retrieved 26 February 2019. This article incorporates text from a publication now in the public domain: Chisholm, Hugh, ed. (1911). "Abbotsford" . Encyclopædia Britannica. 1 (11th ed.). Cambridge University Press. Wikimedia Commons has media related to Abbotsford House. "Abbotsford" . The Nuttall Encyclopædia. 1907. "Abbotsford" . The New Student's Reference Work . 1914. "Abbotsford" . Collier's New Encyclopedia. 1921.